Since its recent low on December 24th, the S&P 500 has seen a significant rally that, while slowing in its momentum as it closes in on resistance, has held up in the past week. 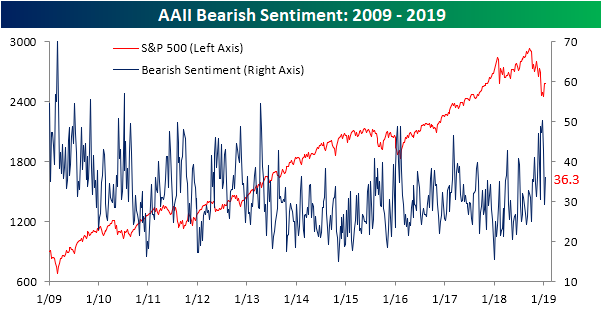 But optimism, as seen through the AAII individual investor survey, has cooled as these resistance levels are reached. Bullish sentiment fell this week to 33.5% after hitting the highest level since early November last week (38.5%). 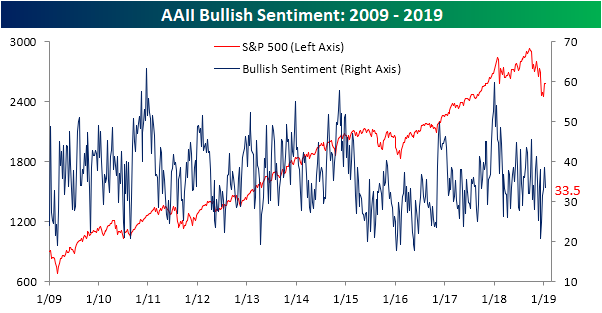 The decline this week brings bullish sentiment back below the historic average but still well above lows hit in mid-December. As optimism has declined, pessimism has picked up. Bearish sentiment has moved within a wide range in the past couple of months with it settling on the lower end this week at 36.3%. That is up from last week’s level of 29.4%, Even with the increase, though, it still has a ways to go before getting back to the 50% peak from only a few weeks ago. The increase in bearish sentiment could be a result of investors not trusting in the market’s ability to surge past the technical points of resistance we have recently highlighted that have been hit this week. Like bullish sentiment, neutral sentiment also took a minor hit this week, falling from 32.7% down to 30.2%. 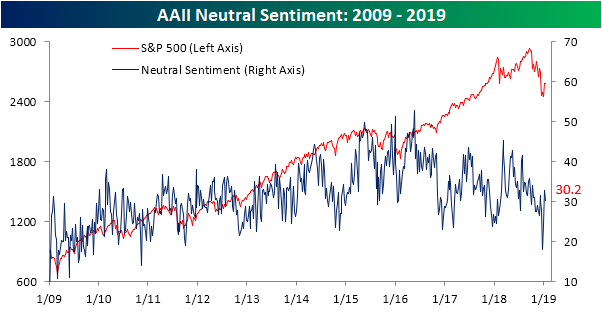 This comes only a few weeks after investors became increasingly polarized when neutral sentiment collapsed all the way down to 18.2%.